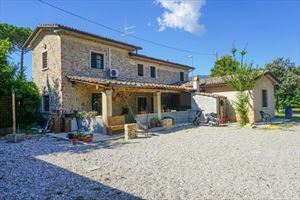 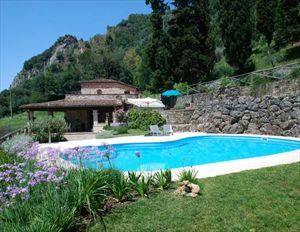 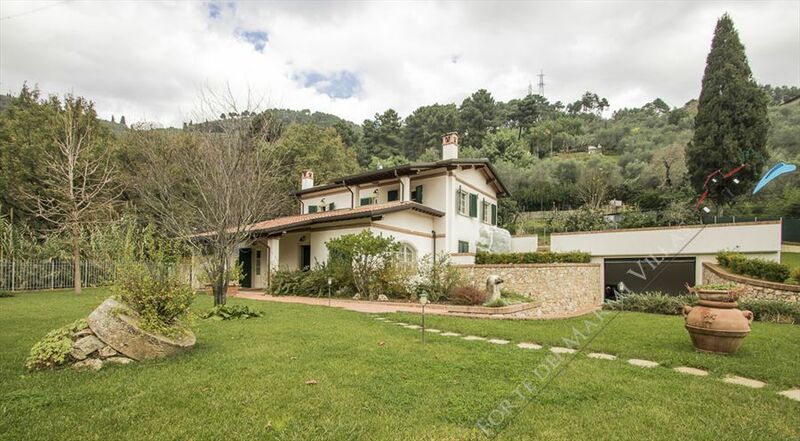 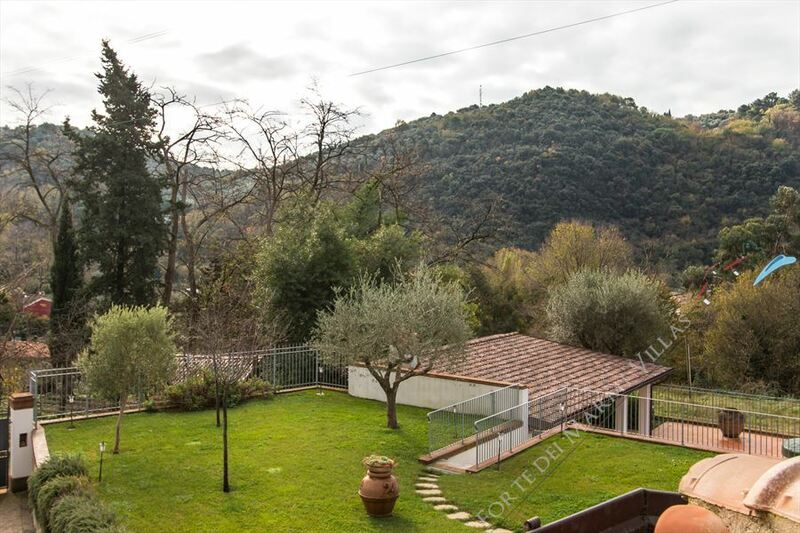 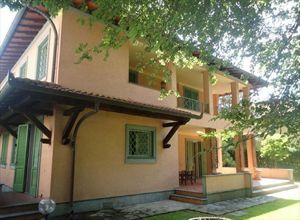 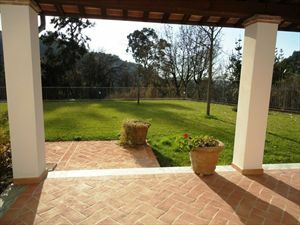 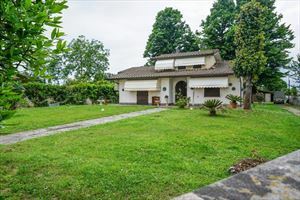 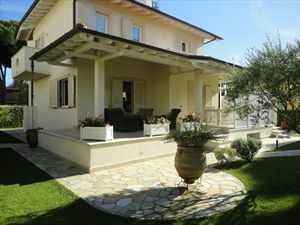 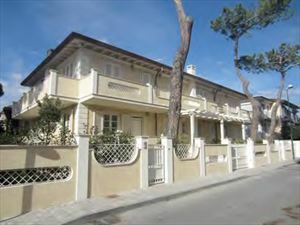 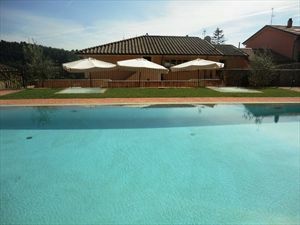 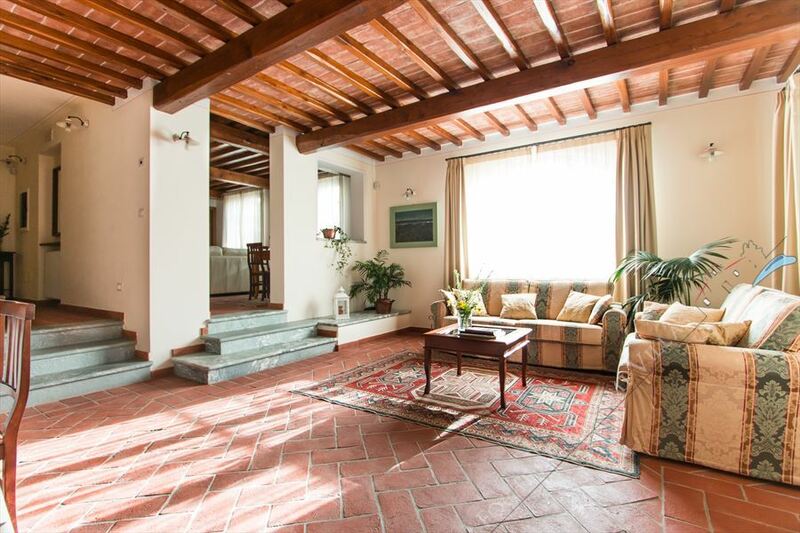 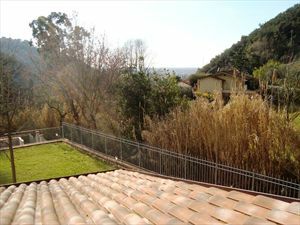 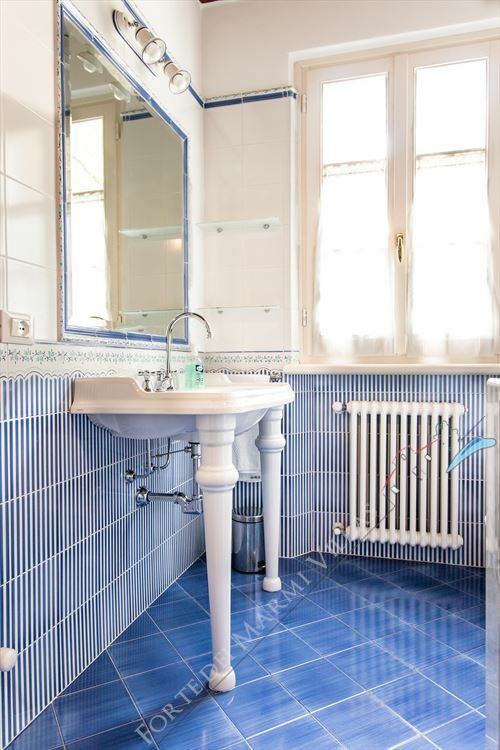 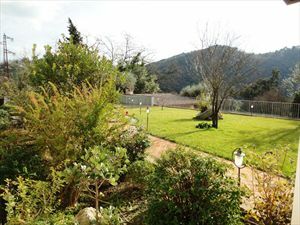 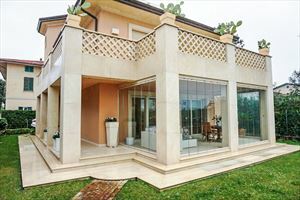 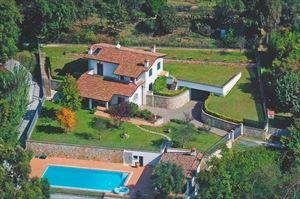 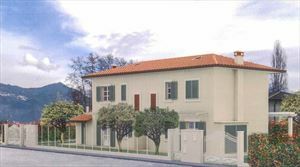 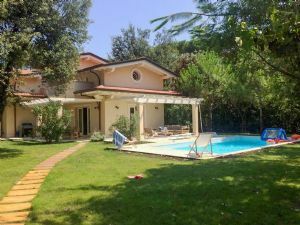 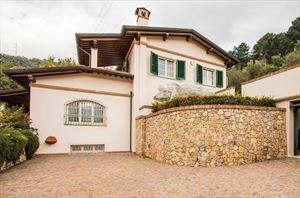 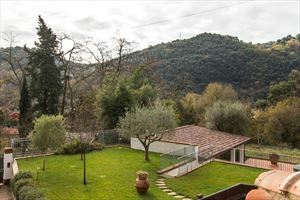 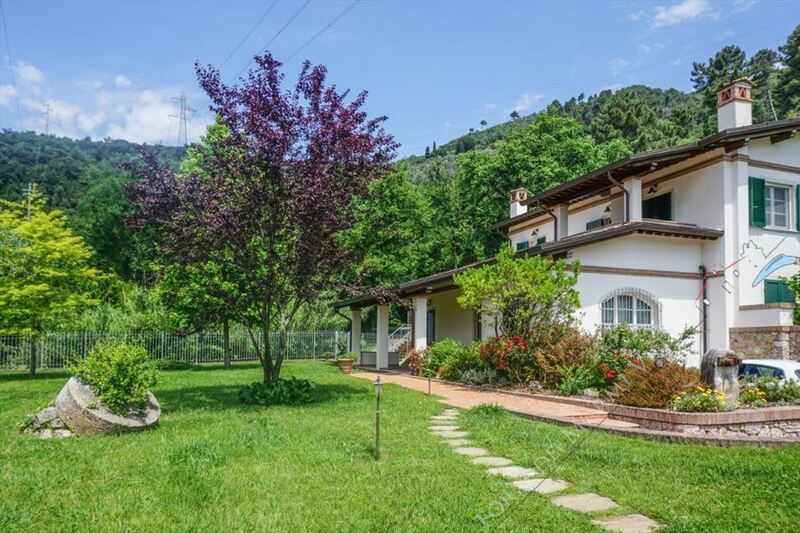 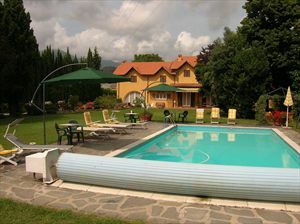 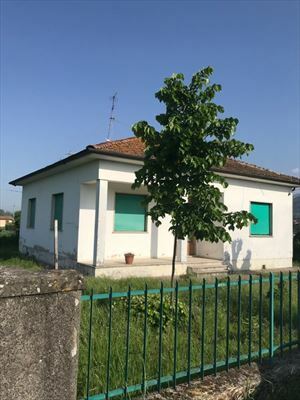 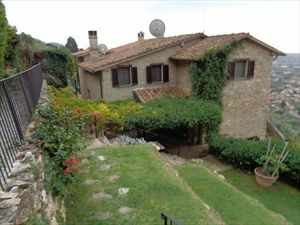 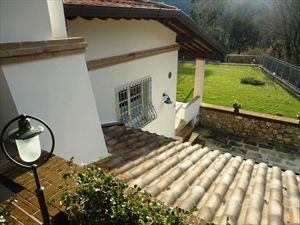 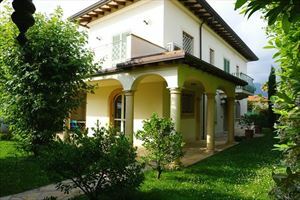 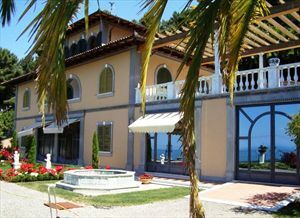 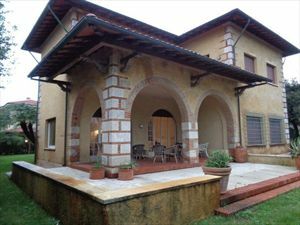 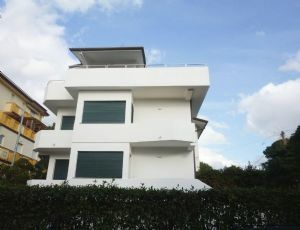 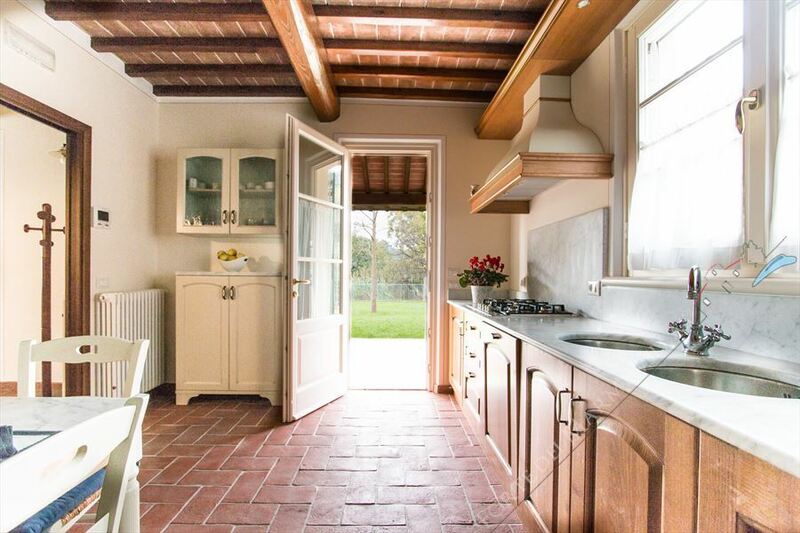 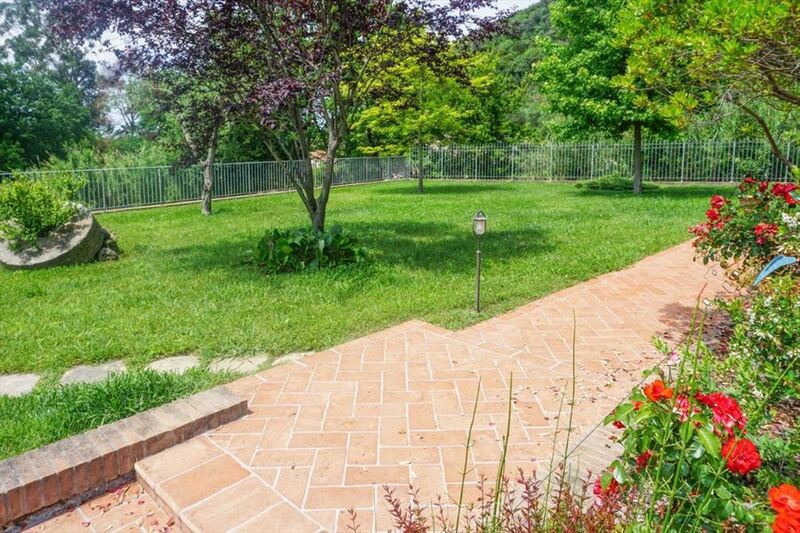 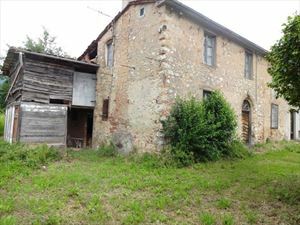 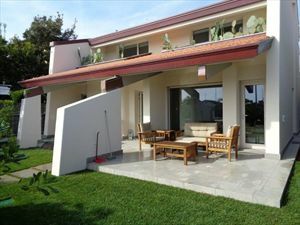 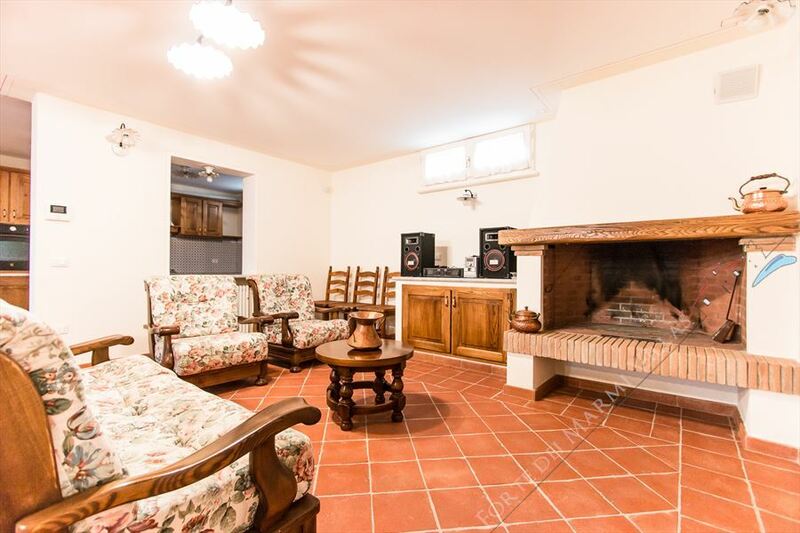 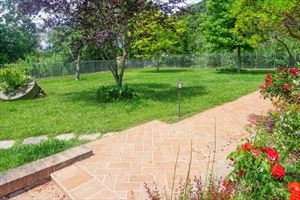 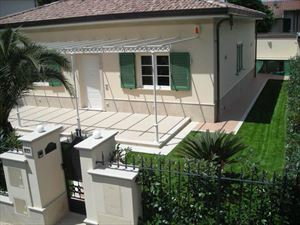 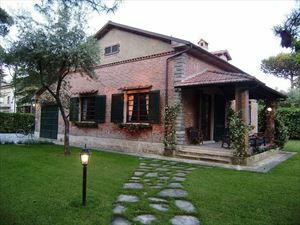 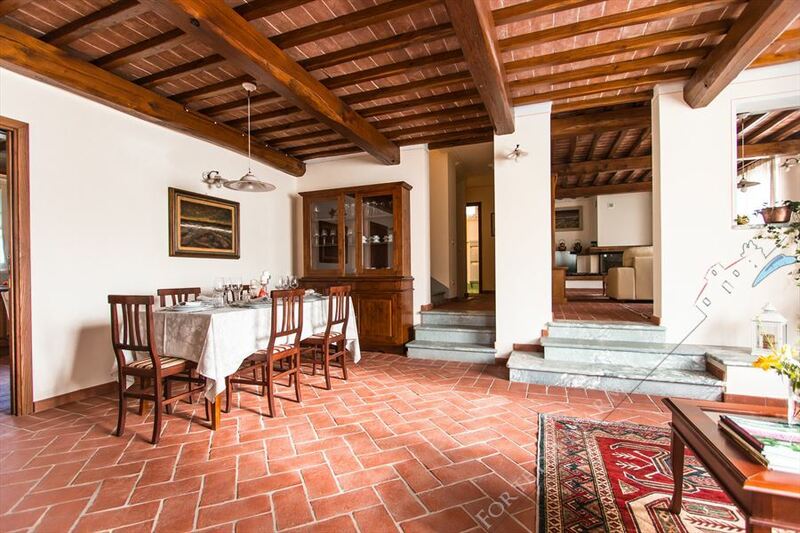 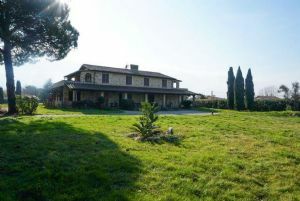 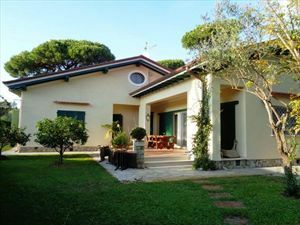 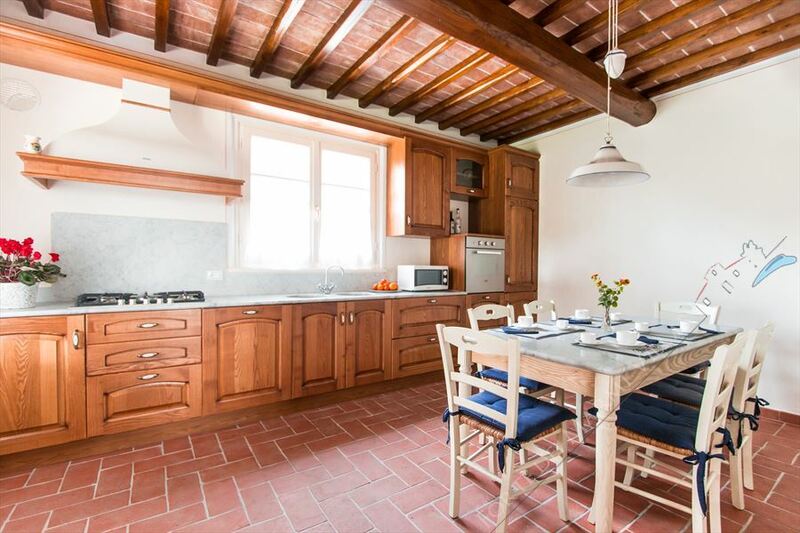 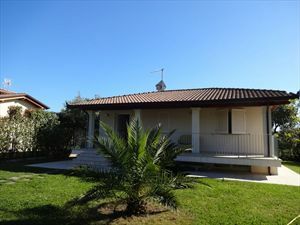 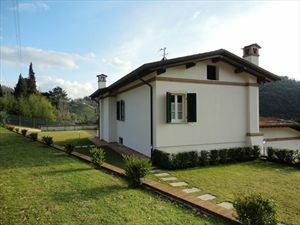 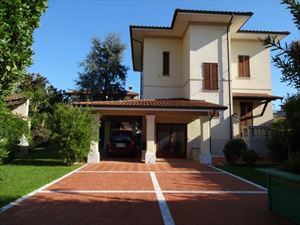 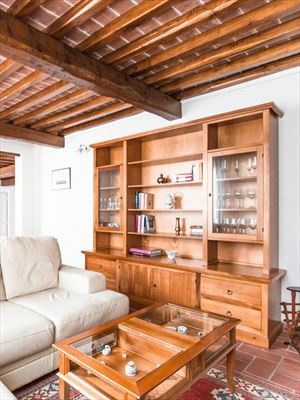 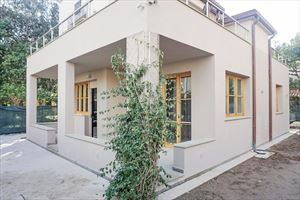 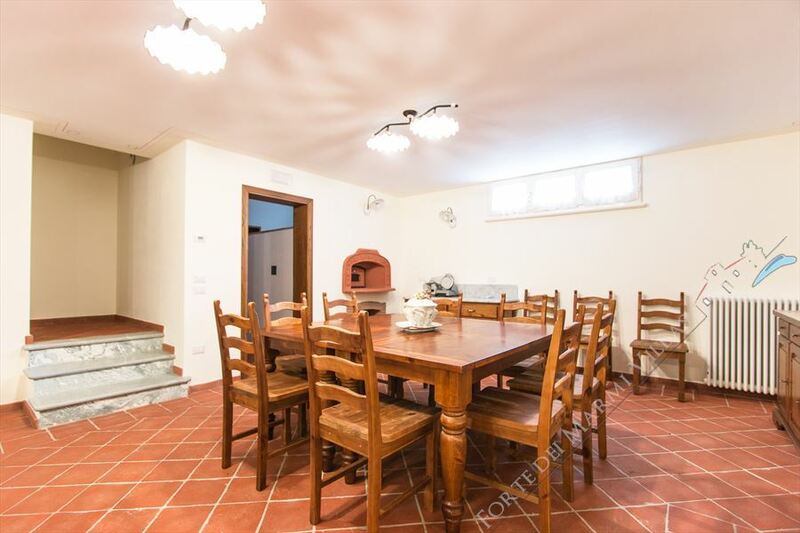 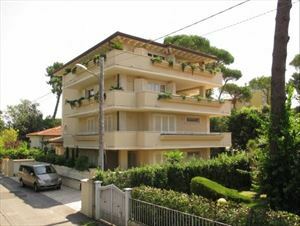 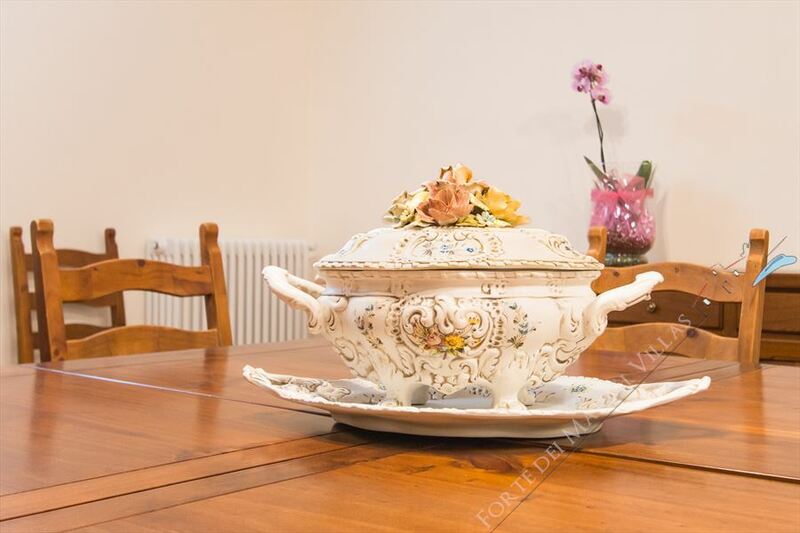 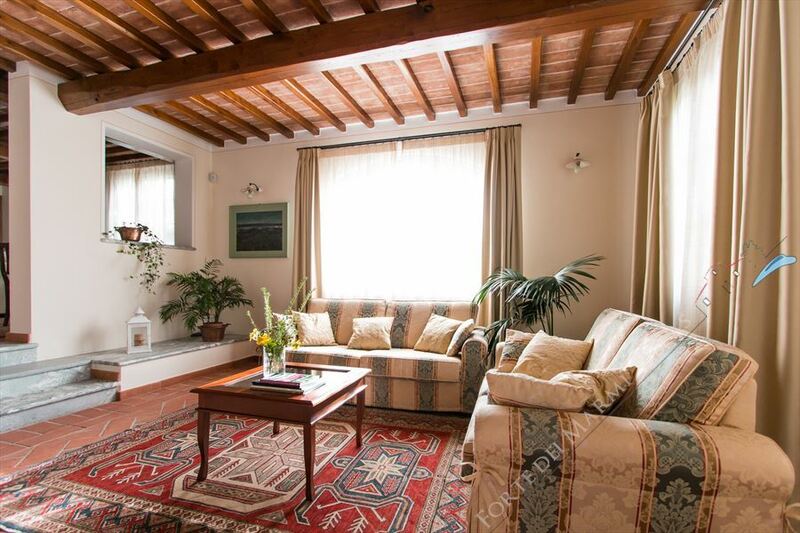 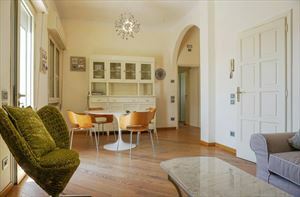 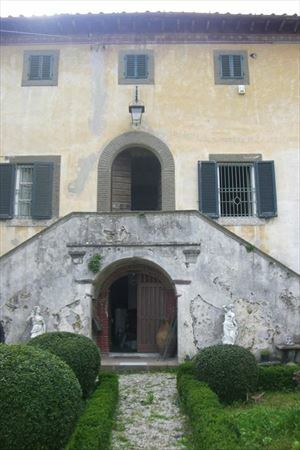 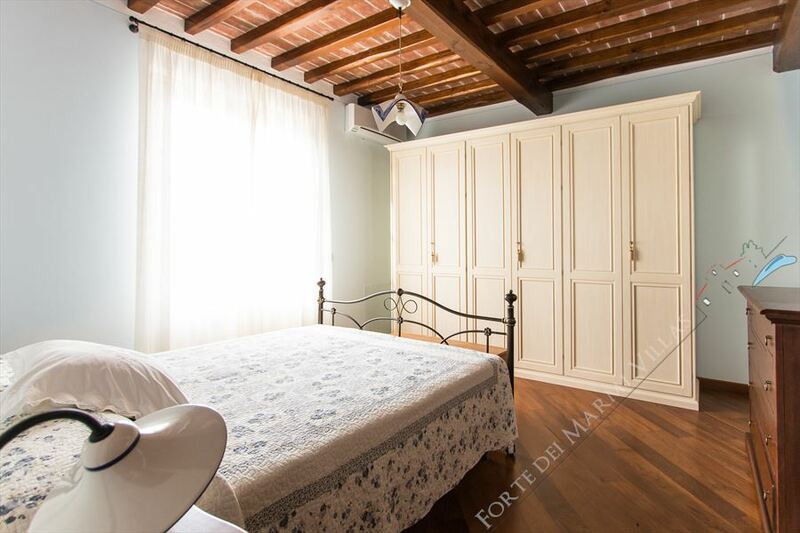 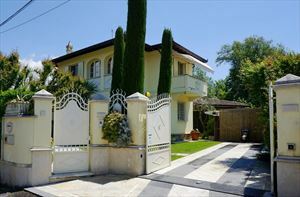 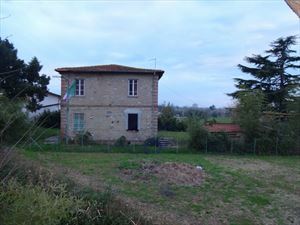 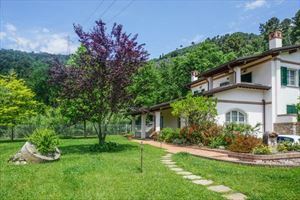 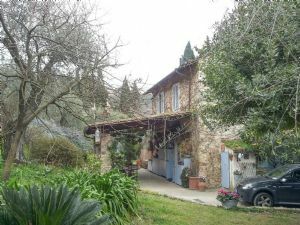 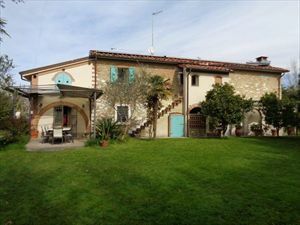 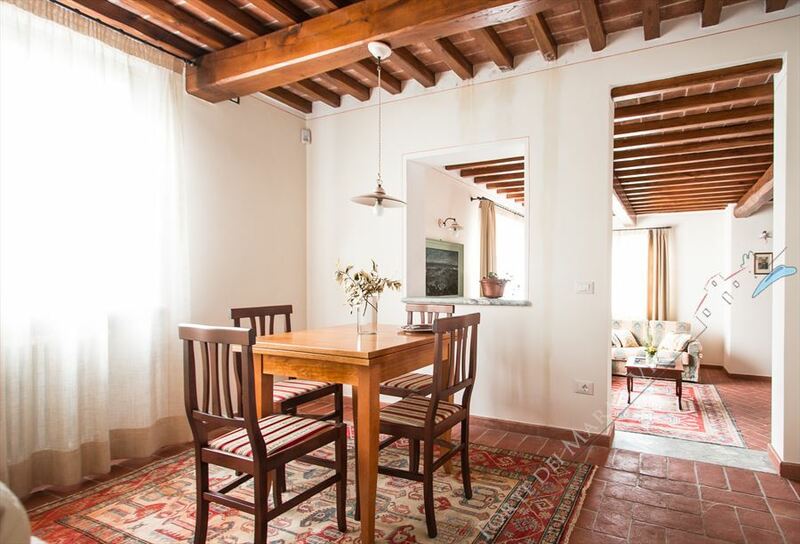 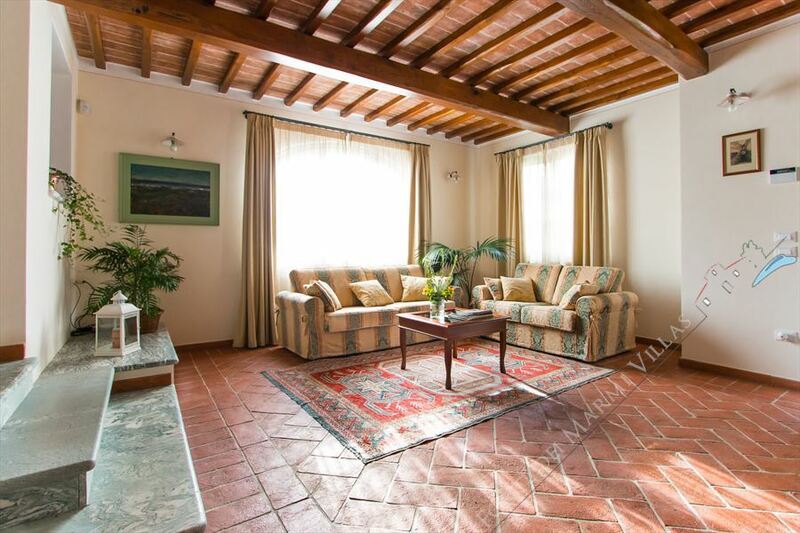 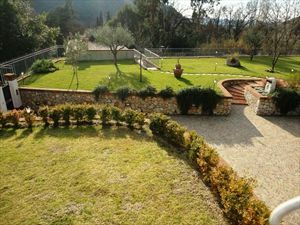 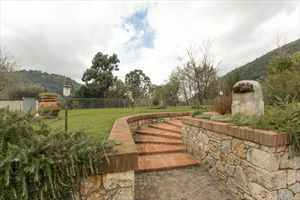 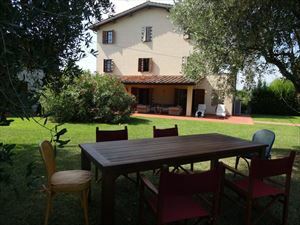 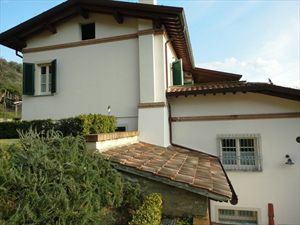 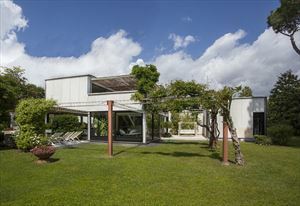 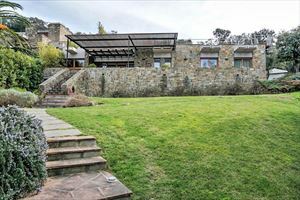 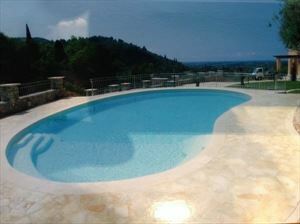 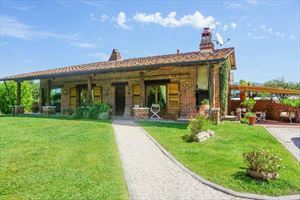 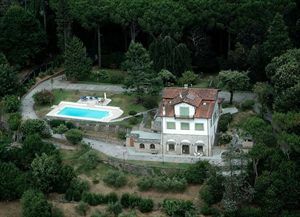 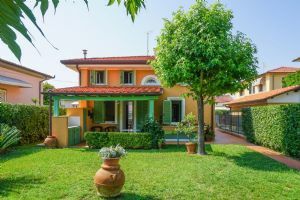 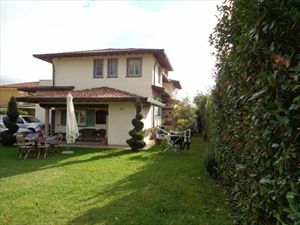 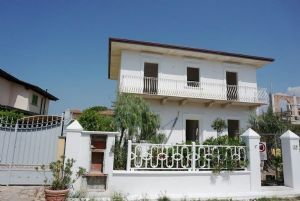 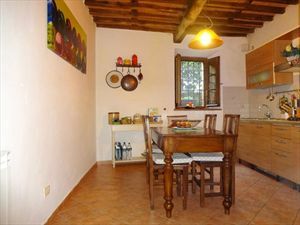 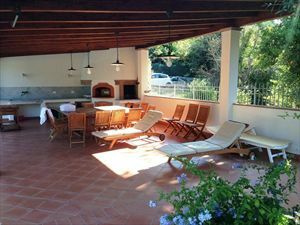 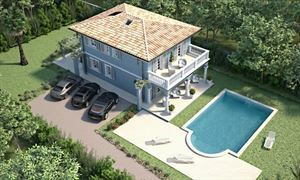 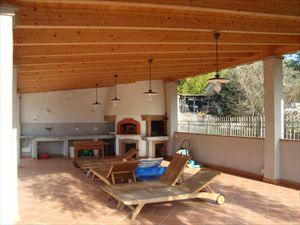 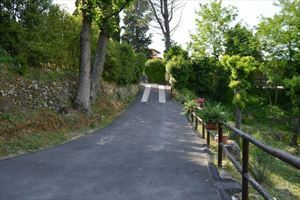 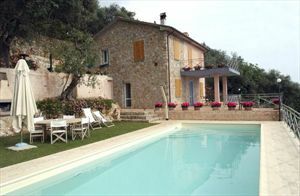 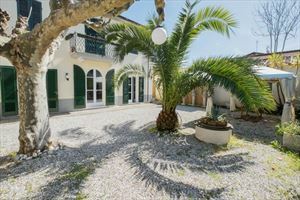 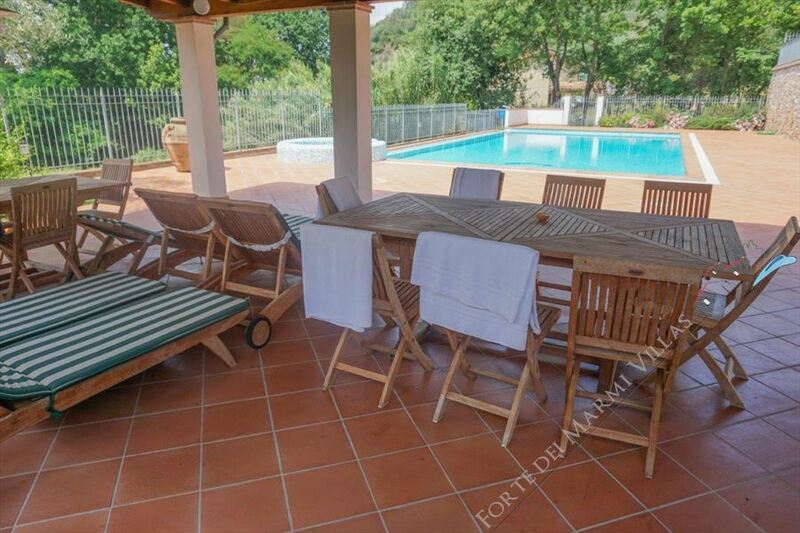 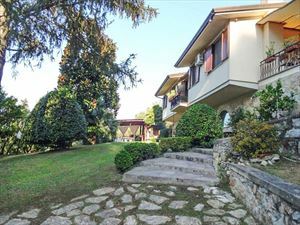 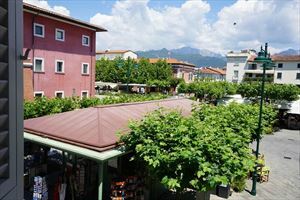 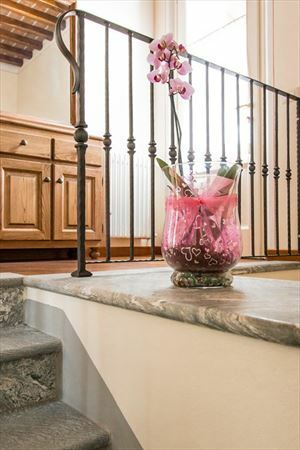 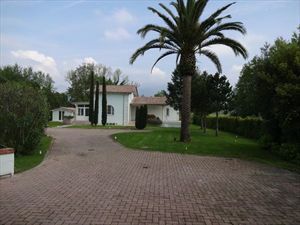 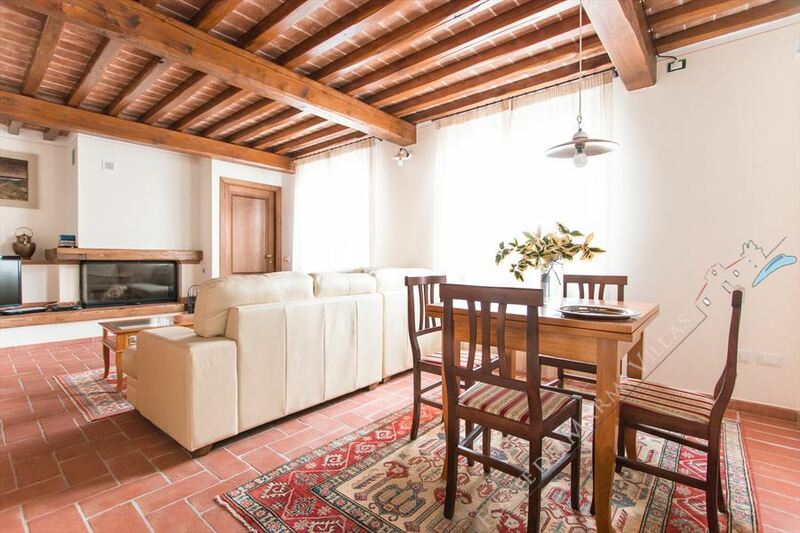 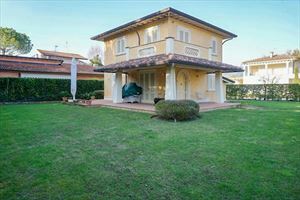 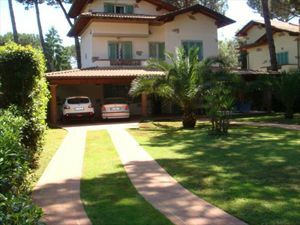 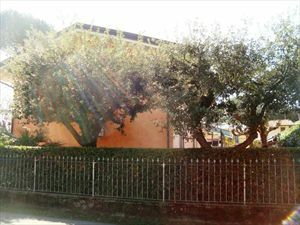 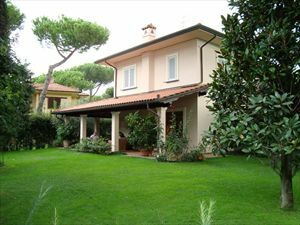 Beautiful detached villa with garden of 2000 sq.m. 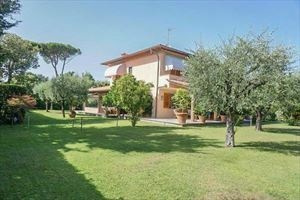 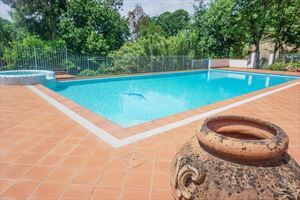 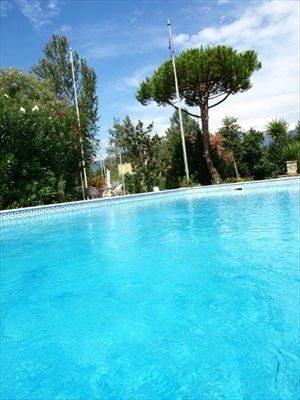 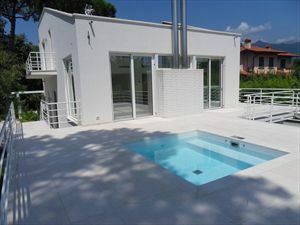 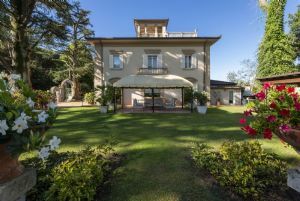 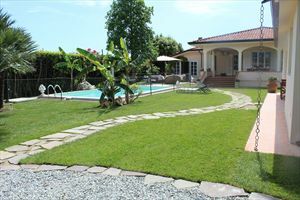 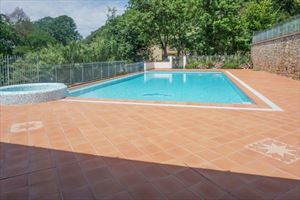 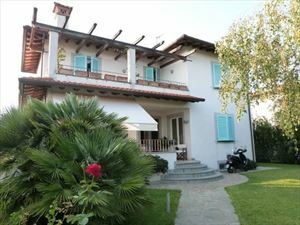 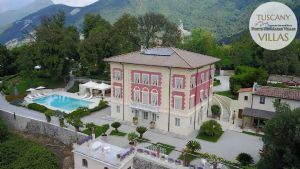 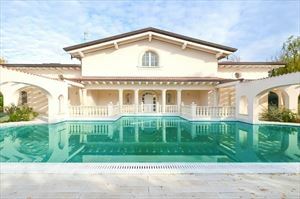 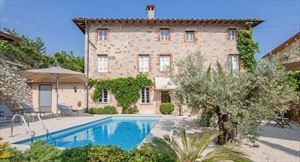 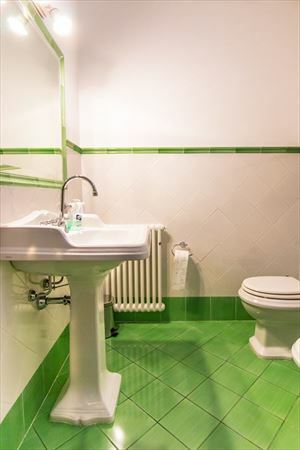 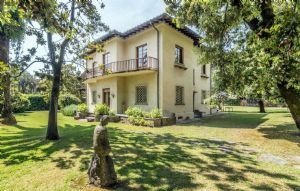 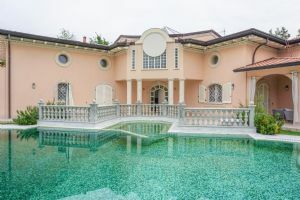 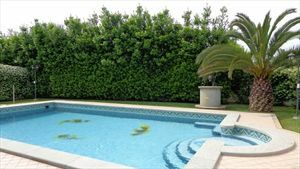 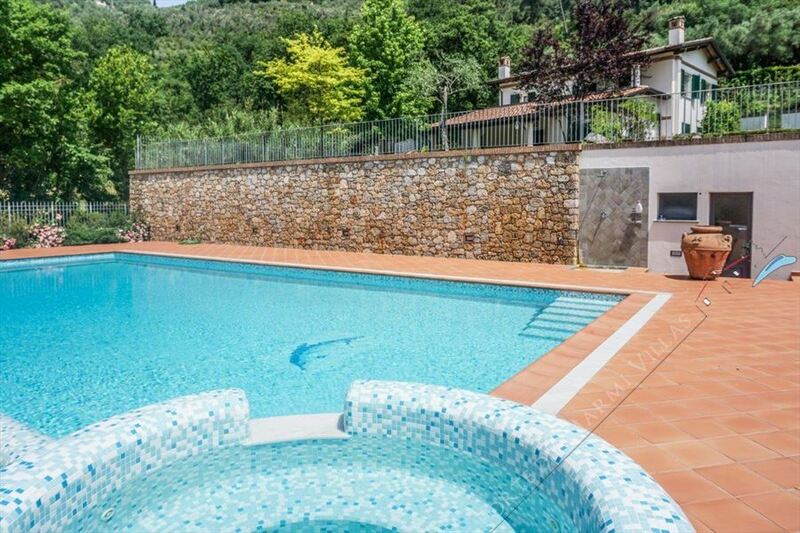 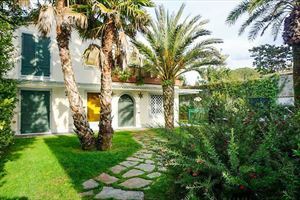 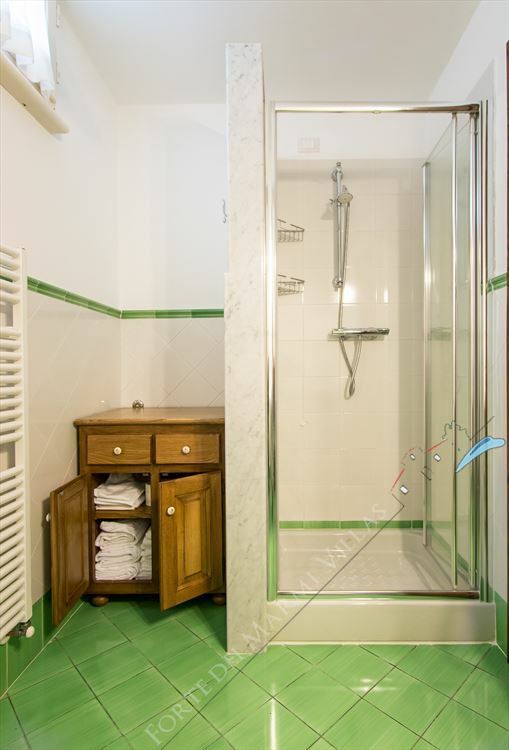 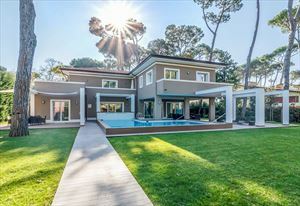 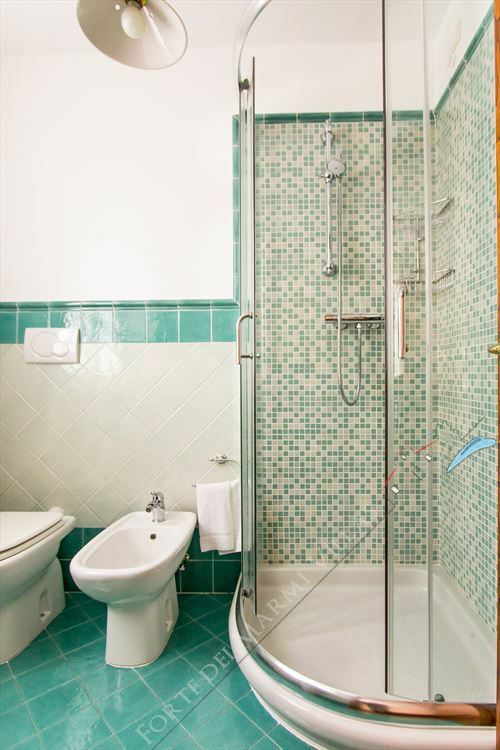 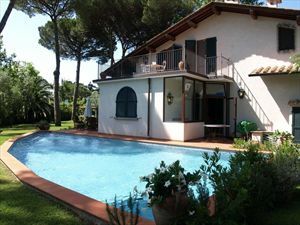 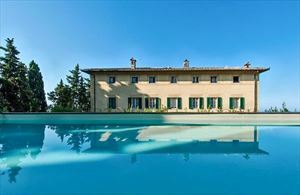 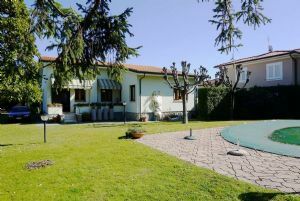 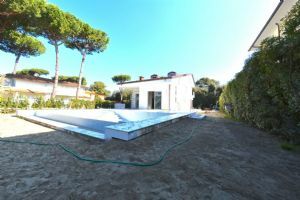 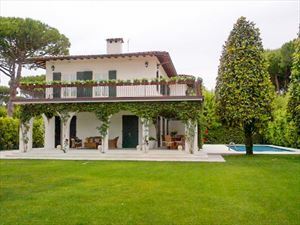 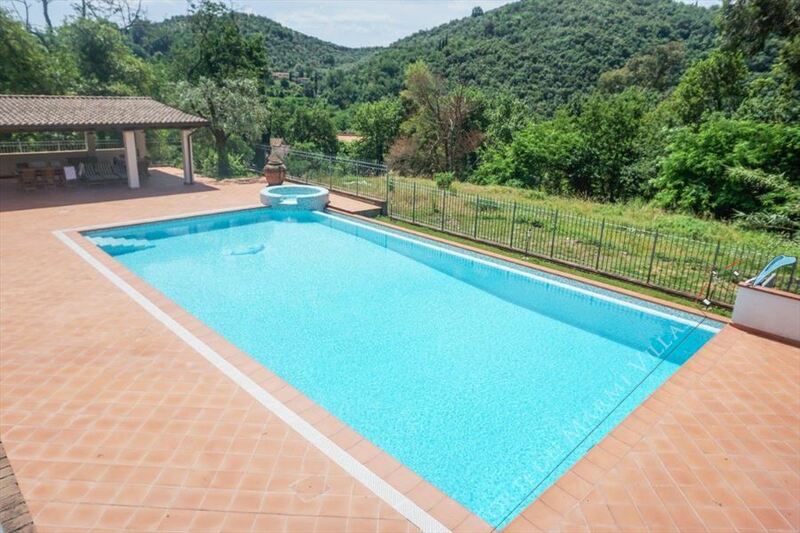 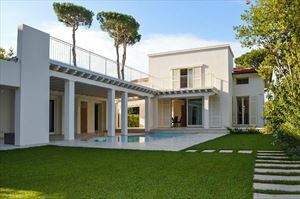 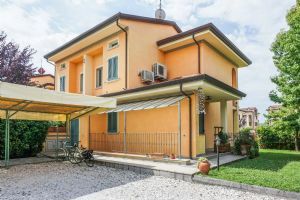 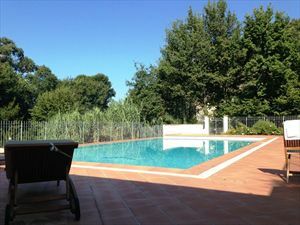 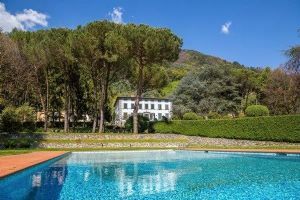 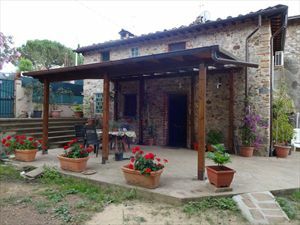 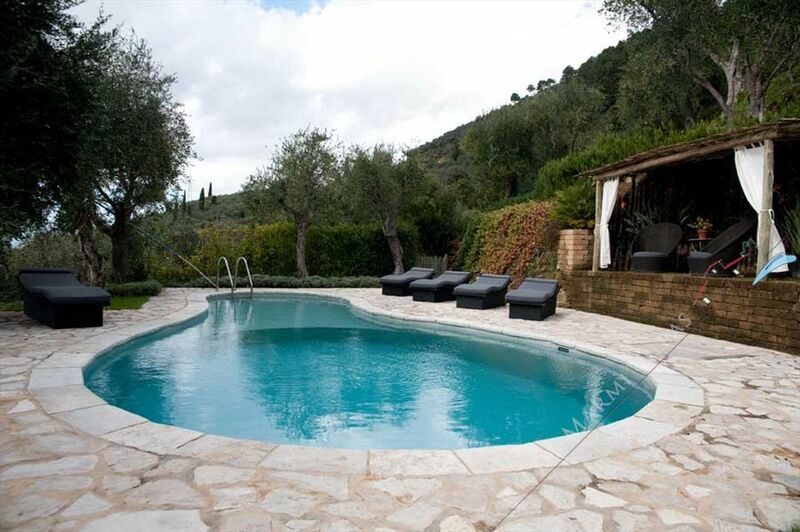 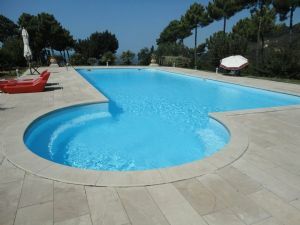 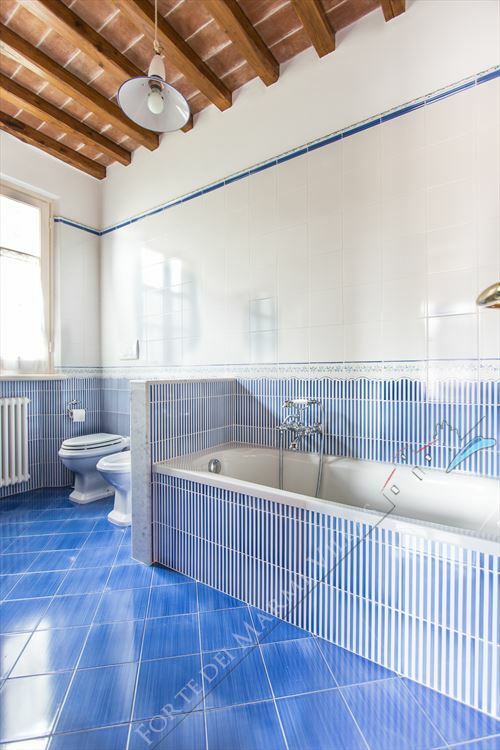 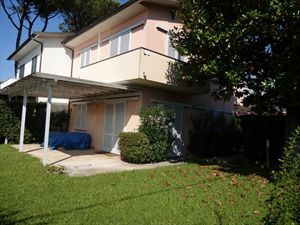 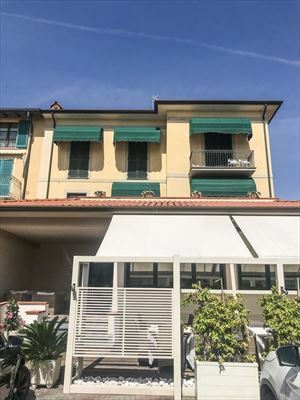 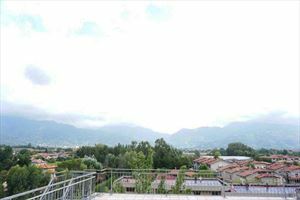 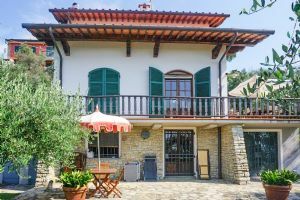 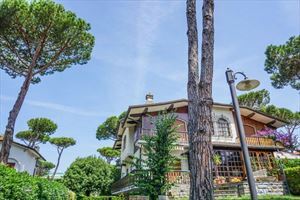 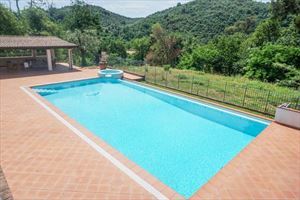 and swimming pool (15x7 m.) with bath tub, located in the green of the Versilia about 6 kilometers from the beach of Marina di Pietrasanta. 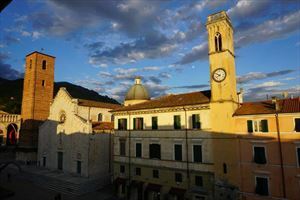 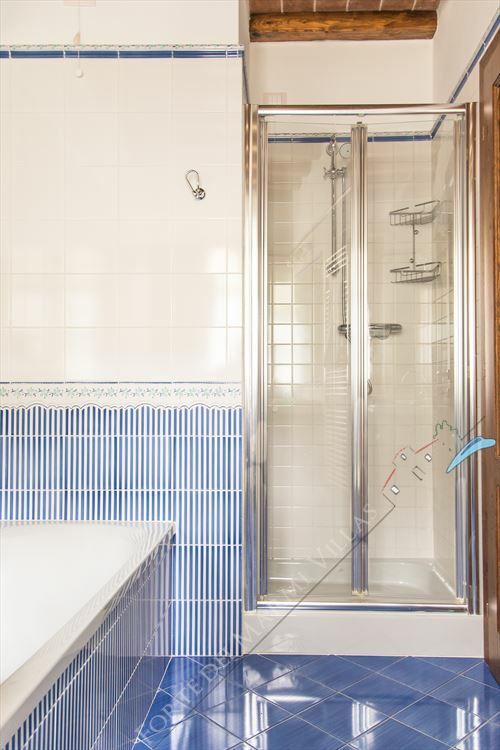 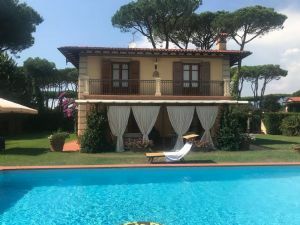 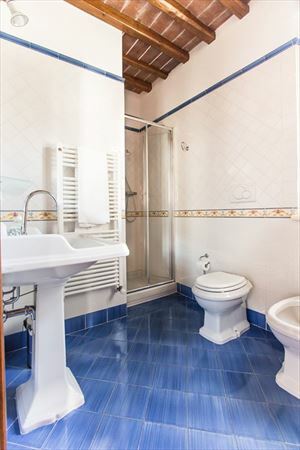 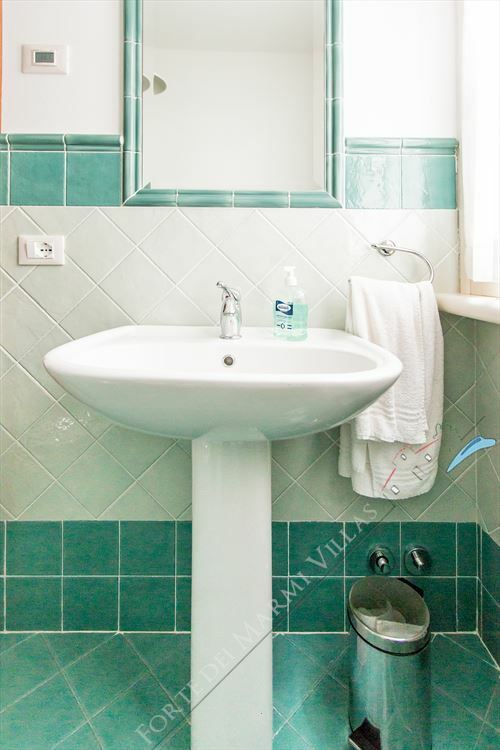 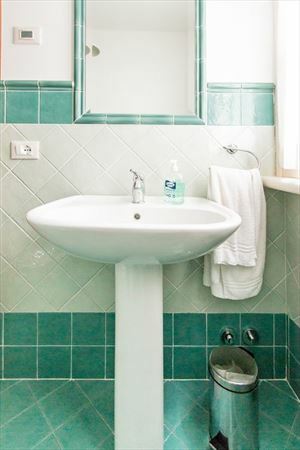 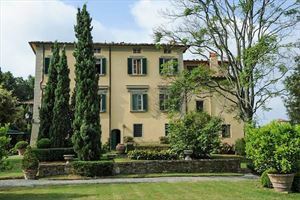 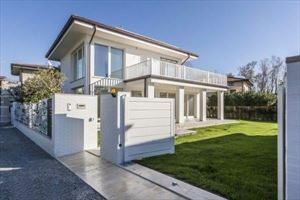 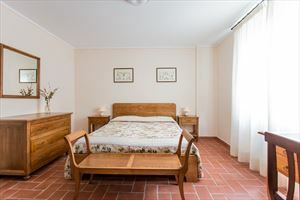 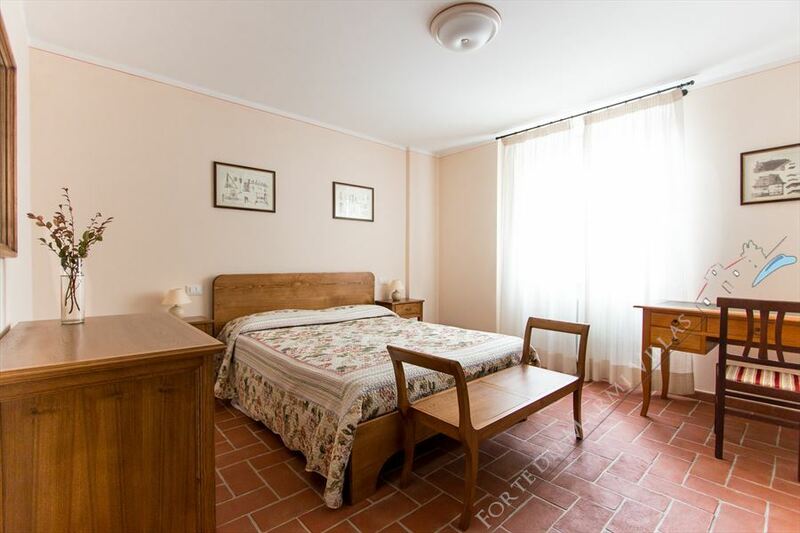 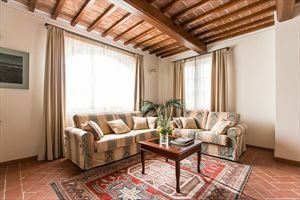 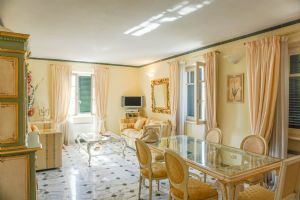 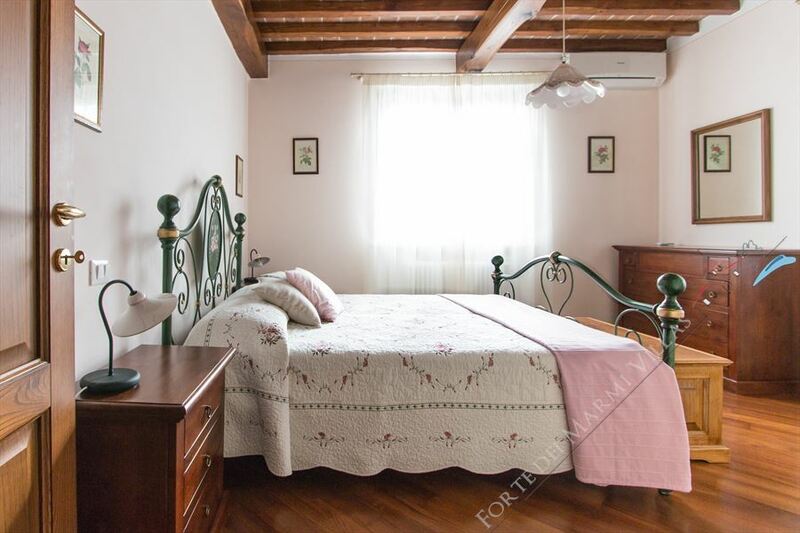 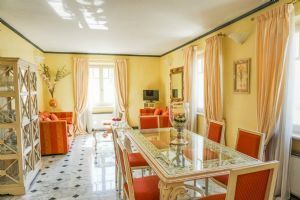 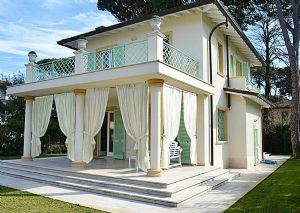 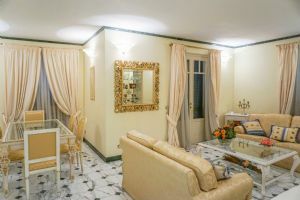 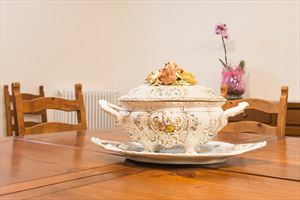 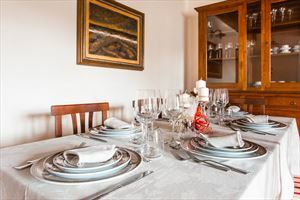 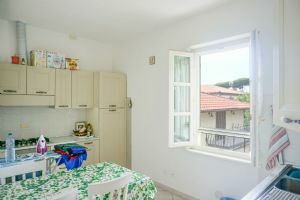 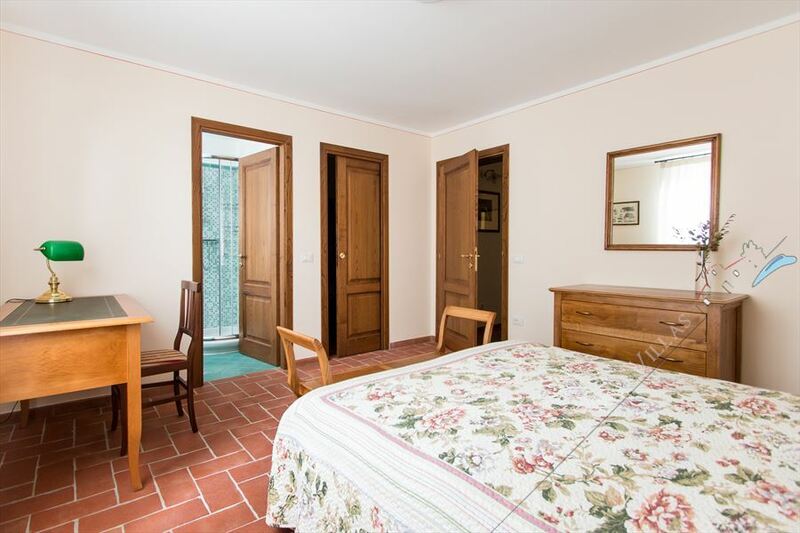 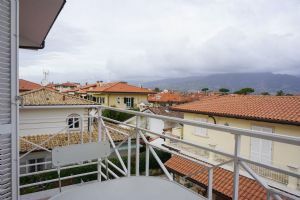 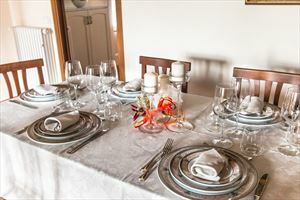 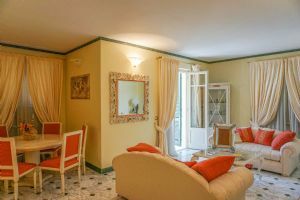 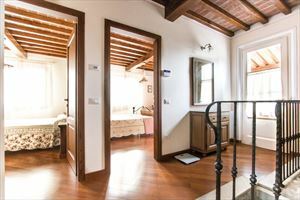 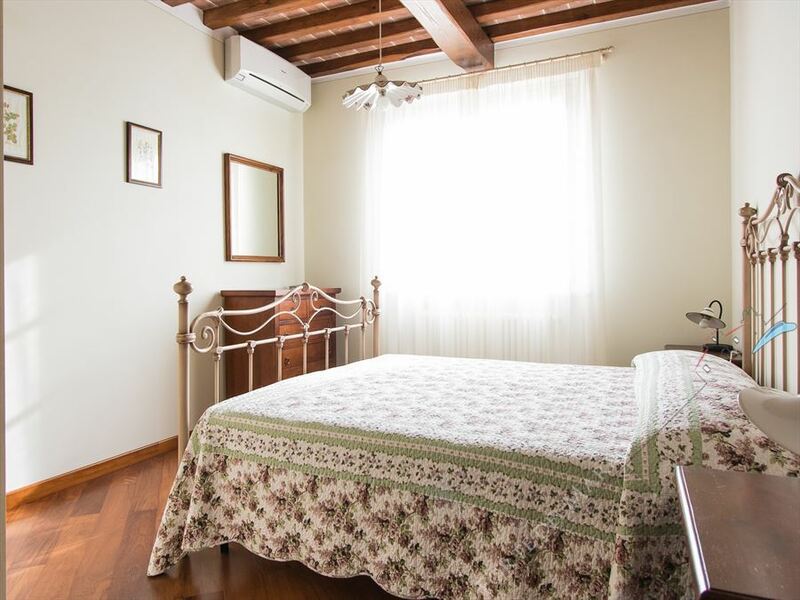 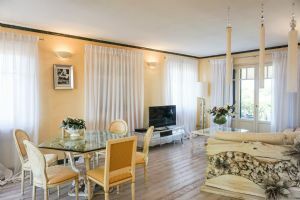 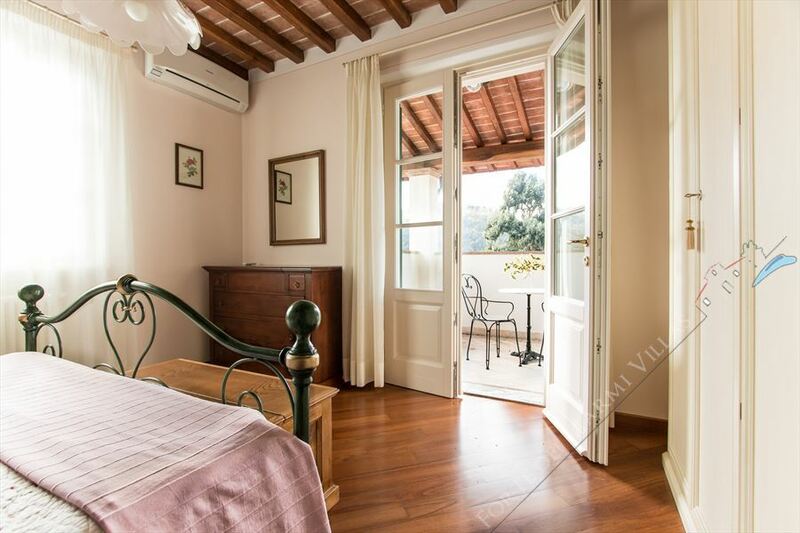 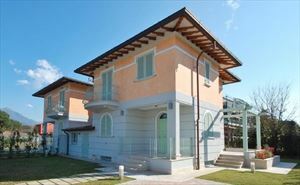 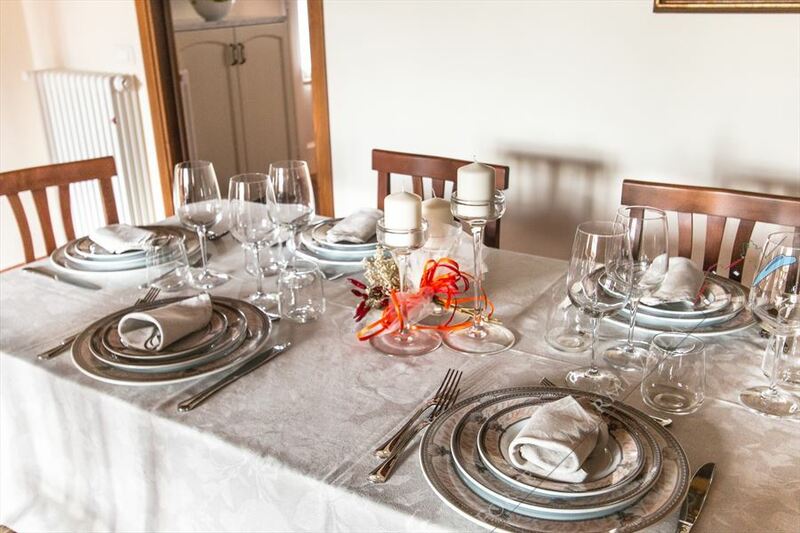 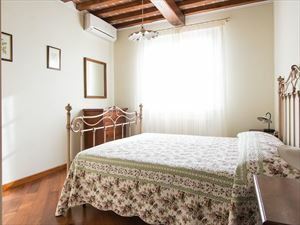 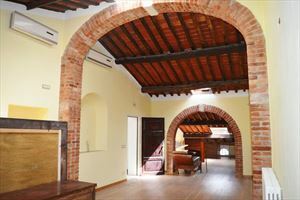 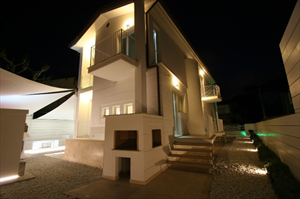 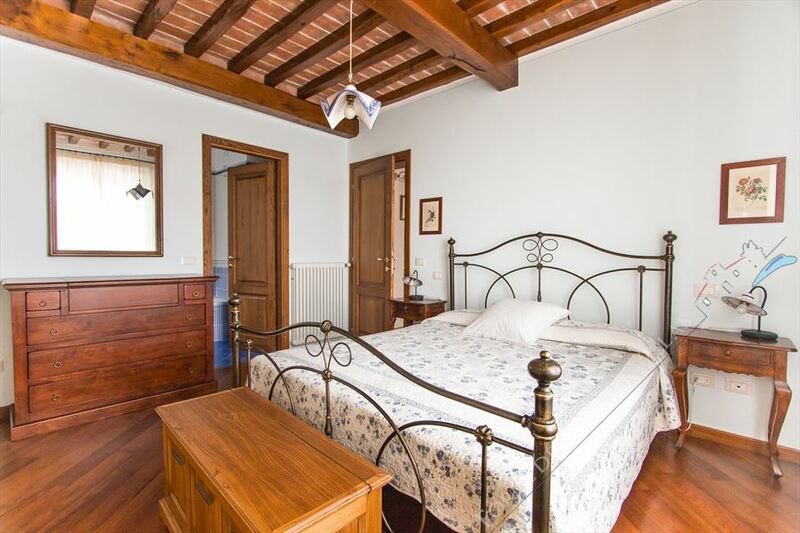 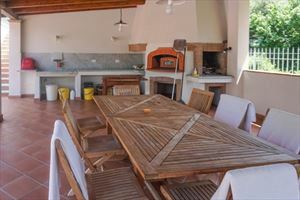 The villa has air conditioning in rooms, alarm system and internet connection. 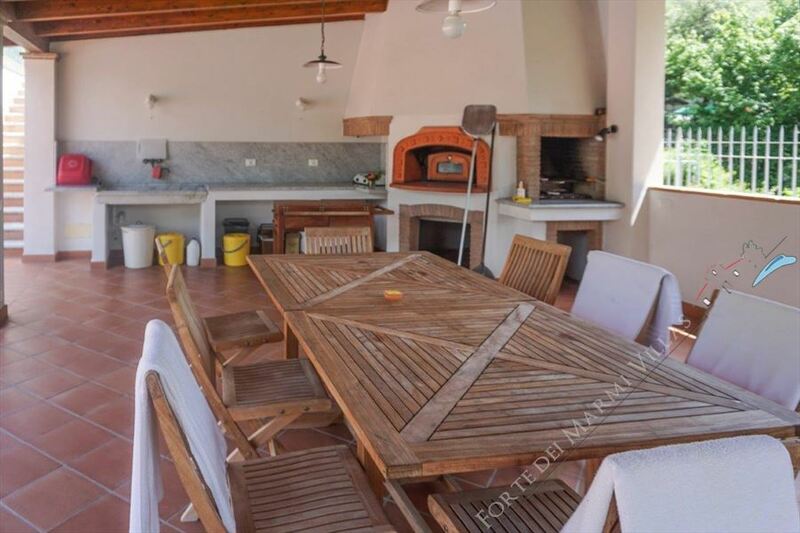 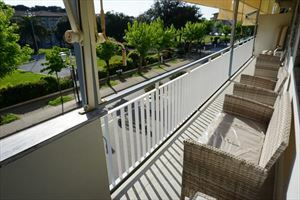 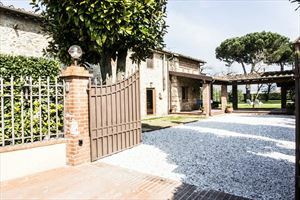 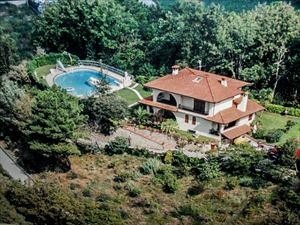 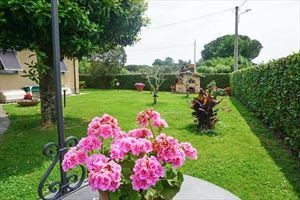 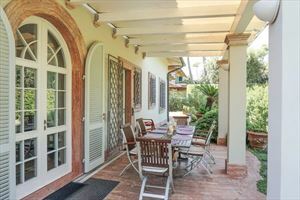 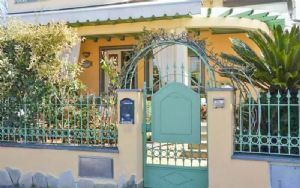 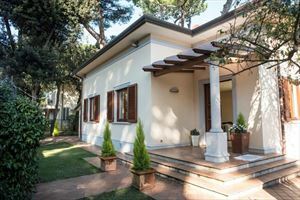 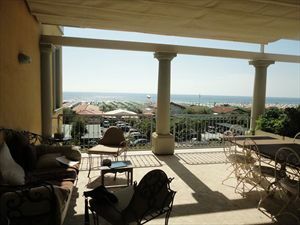 garden area in front of the house includes main access with electric gate, garage of 100 square meters with the front door inside, covered terrace with sea views, room with table and chairs for eating. 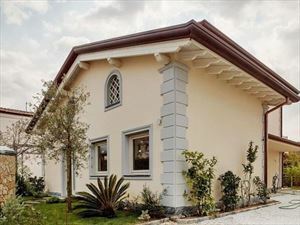 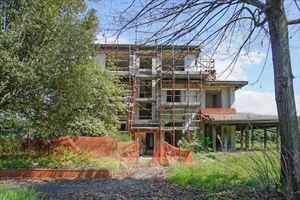 Ground floor consists of living room, dining room, kitchen, TV room with fireplace, bathroom with shower, bedroom with a sofa bed and bathroom. In the basement there are a large living room, dining room, kitchen with wood stove, utility room, laundry room with washer and dryer, double bedroom and bathroom with shower. 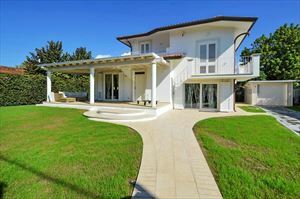 First floor: master bedroom with balcony - sea views and bathroom with bath and shower; 2 double bedrooms, bathroom with bath and shower.